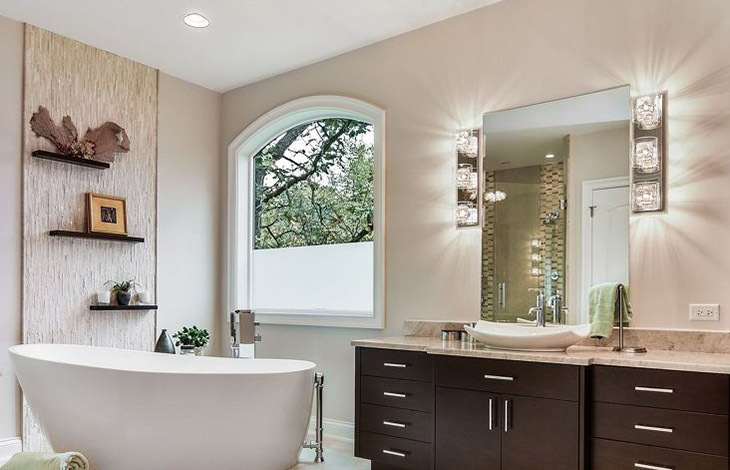 Abstract: LED bathroom lighting fixtures provide a viable alternative to conventional halogen and fluorescent lamps to address various lighting requirements by using a blend of ambient, task and accent lights. 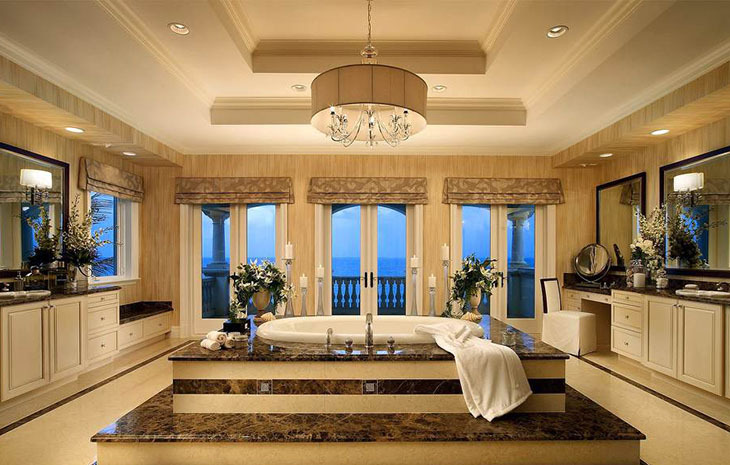 The bathroom is undoubtedly one of the most important rooms in a residence. A bathroom is no longer a purely functional space for personal hygiene activities such showering, toileting and grooming, it has been elevated to a place of peace that is rare in today's hectic lifestyles, a haven of tranquility or even a personal style statement. Good residential lighting starts with the bathroom. Bathroom lighting should be one of the essential design elements in interior architecture, instead of staying low on the list of priorities in lighting design. A good bathroom lighting scheme can go a long way toward creating the right atmosphere. A good bathroom lighting plan is a series of layers that accommodate different lighting needs to comfortably use the space for a range of routine activities. A well-lit bathroom takes advantage of a blend of different types of illumination to transform the look and ambience of the space with layered patterns and intimate atmosphere. A good bathroom lighting plan incorporates the right balance of ambient and task lighting – from a bright and functional area to a soothing retreat. Lighting in bathroom needs to be versatile to provide an inviting environment for relaxation as well as functional, for performing tasks like bathing, grooming, shaving, and applying makeup. The elementary light effects that harmonically render a bathroom lighting atmosphere pleasant to human sight may be classified into different layers, namely ambient (or general) lighting, task lighting and accent lighting. Various levels of activity can be addressed with multiple lighting schemes by using a blend of task, ambient, accent lights or fixtures. Ambient lighting provides the overall illumination of the bathroom for safely moving about. General lighting can be achieved by installing ceiling-mounted fixtures, recessed downlights, wall lamps, or bathroom heater light combinations. The white light of a desired color rendering index and color temperature illuminated by these fixtures defines the bathroom space, sets an elementary atmosphere and balances the brightness of other fixtures. Indirect lighting, a type of ambient lighting, reflects light off of a ceiling or wall surface thereby minimized shadows and reflected glare, resulting in a pool of pleasing illuminance. 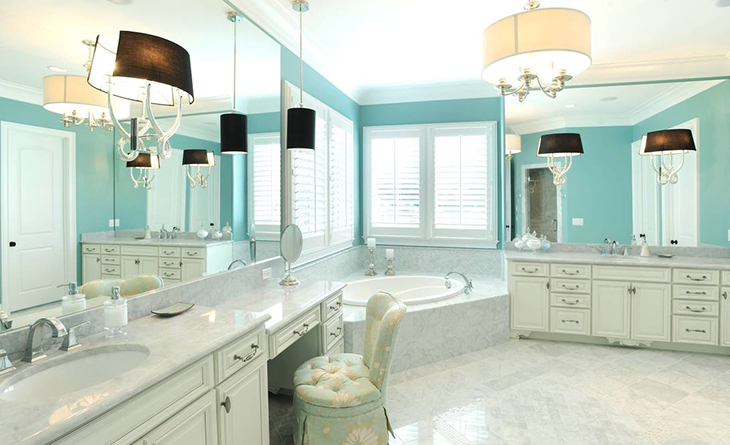 Most indirect lighting is delivered by pendant light fixtures that are chosen to compliment the bathroom decor. Task lighting is provided to illuminate a predetermined areas of the bathroom, such as the vanities, shower stalls, bathtubs, toilets, and bathroom cabinets. 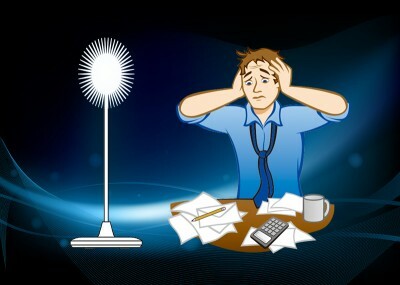 General lighting alone fails to address all task requirements very well in bathrooms and may cause glare and shadows. 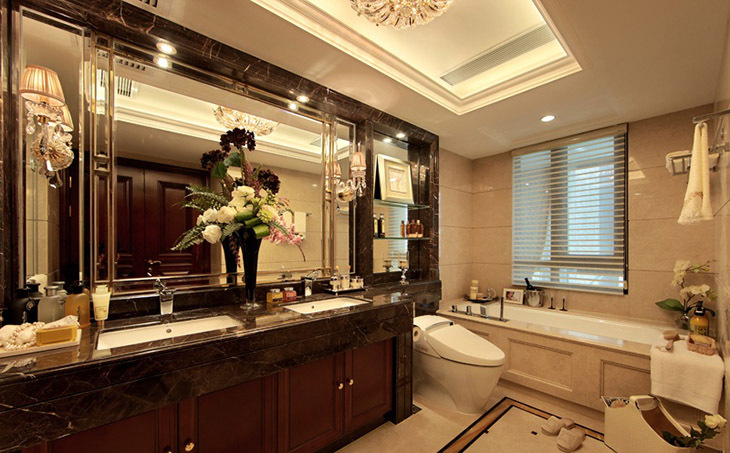 Bathrooms are interior spaces that pack a lot of activities into a small space. Grooming or applying makeup, for example, is an especially significant task. A uniform, glare-free illumination around the bathroom mirror is critical for performing such tasks. A bathroom lighting system comprising ambient and task light sources provides the flexibility to create desired lighting scenes in which shadow, reflection, flickering or other abrupt and disturbing variation of brightness are avoided. Accent lighting throws a defined beam of light to accentuate an interesting architectural feature therefore making the bathroom environment more interesting and intimate. The accent layer adds clarity to the overall composition by creating visual interest and focal points through luminance contrast. Variations in color or intensity may introduce dynamic lighting elements to make the bathing space more engaging and less monotonous. Many directional luminaires such as a spotlight, track light, sconce, or downlight can be used to create accent effects. Ambient, task, and accent lighting play different functional roles and objectives in the composition of a comfortable visual environment. The most important bathroom lighting is at the vanity. A mirror is an essential bathroom component that add a practical element to any modern dwelling. Vanity lighting or mirror lighting must provide adequate, even illumination for men to shave or women to apply makeup, yet be flattering enough to complement skin tones. A vanity light can be highly decorative and stylish, but more important than the appearance of the fixture is how it produces the functional and soft light directly onto a user's face. Lights specifically designed for vanity lighting should encompass the face with high color rendition to enhance visual clarity, minimizing shadows under the chin and eyes, while lighting up cheeks and forehead properly. Vanity lighting is supplied by fixtures mounted horizontally above the mirror or vertically to the sides. The vertically arranged fixtures deliver vertical cross illumination at eye level on both sides of the mirror. They produce desirable, virtually shadowless lighting that creates a very symmetrical look. Vanity lights arranged in a horizontal row above a mirror project light downwardly which may sometimes creates shadows that affect the appropriate application of grooming or makeup which generally relies on illuminating clearly certain facial features. The electrical safety deserves special attention because bathrooms are often humid places where lighting equipment is inevitably exposed to water, steam and condensation. Since electricity and water make a dangerous combination, safety and protection would take precedence over functionality and aesthetics. The bathroom zones are identified by IEE Wiring Regulations to indicate which type of electrical equipment, including lighting fixtures, can be fitted. Light fixtures within a defined zone (classified by the percentage moisture in the location) should have a set minimum IP (ingress protection) rating. Zone 0 - inside the bathtub or shower tray. All lighting fixtures fitted within this zone must be rated at least IP67 (immersion proof) and low voltage (12V max.). Hanging lights, pendant lamps, lighting tracks, and similar lighting fixtures are not allowed to be installed within the space measured 0.9m (3ft) horizontally and 2.5m (8ft) vertically from the top of the bathtub rim or shower stall threshold. Surface-mounted or recessed light fixtures are acceptable as they do not present a significant shock hazard. Zone 1 - above the bathtub or shower stall to a height of 2.25m. Light fixtures installed within this area must have a minimum of IP44 protection against water spray from any direction. A residual-current device (RCD), or residual-current circuit breaker (RCCB) with a tripping current of 30mA or less is required if the light uses a 240V power supply. If there is a shower head above the defined height, IP65 is required for the light fittings. 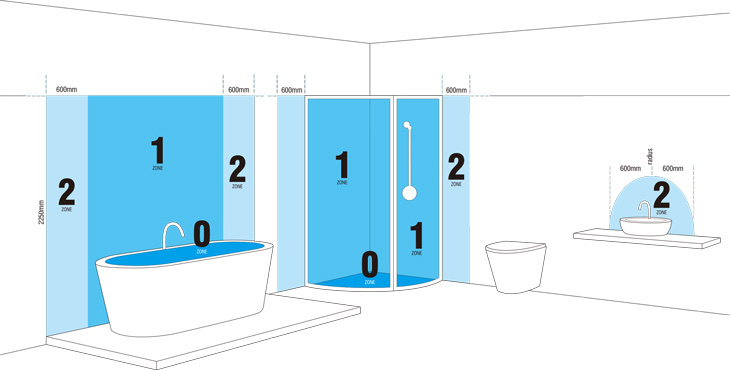 Zone 2 - area stretching 0.6m outside the perimeter of the bathtub and to a height of 2.25m from the floor, also covering the area within a 60cm radius above wash basin. An IP rating of at least IP44 is required, unless there is a likelyhood of water spray in which case IP65 rating is required. Outside Zones - anywhere outside zones 0, 1, and 2. IP rating is not required, which means any IP rated luminaire can be used in these zones. Bathroom and vanity lighting fixtures are available in a number of designs, styles, and functionalities. Various levels of illumination can be achieved with multiple lighting schemes. 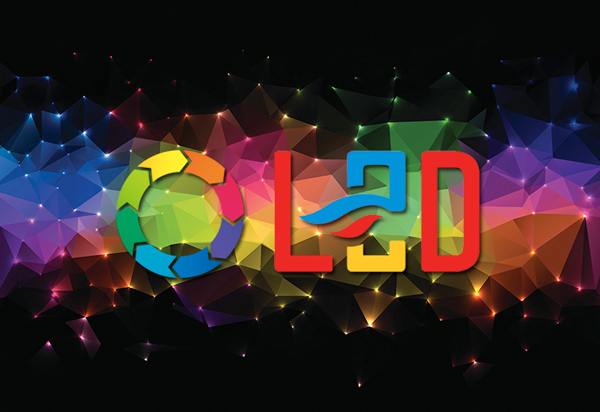 The recent advances in solid state lighting have made LEDs a practical alternative to conventional light sources to provide benefits such as improved efficiency, extended operating life, enhanced robustness, flexible light controllability, and capability to operate in low voltages. LED technology has evolved to a stage that the availability and affordability of aesthetically appealing and functionally practical LED fixtures can compete overwhelmingly with incandescent, halogen, and fluorescent fixtures. 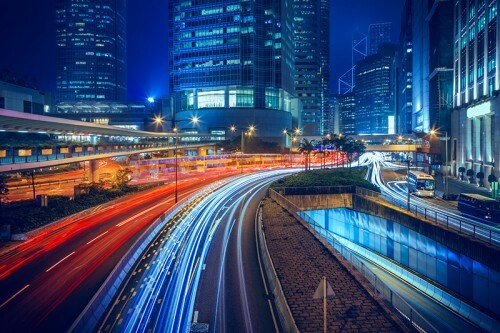 The benefits of LED lighting has led to an increase in the selection and installation of LED luminaires in new implementations and retrofitting projects. A fantastic range of wet-rated, damp-rated, and even fire rated bathroom fittings are available to accommodate varying mounting requirements. 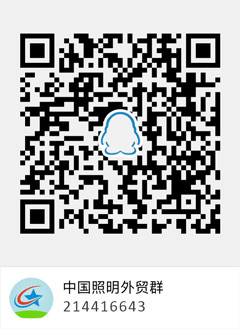 LED Ceiling Lights - Overhead surface mounted LED ceiling fixtures with a wide, soft-edge beam pattern provide the overall illumination of the room. 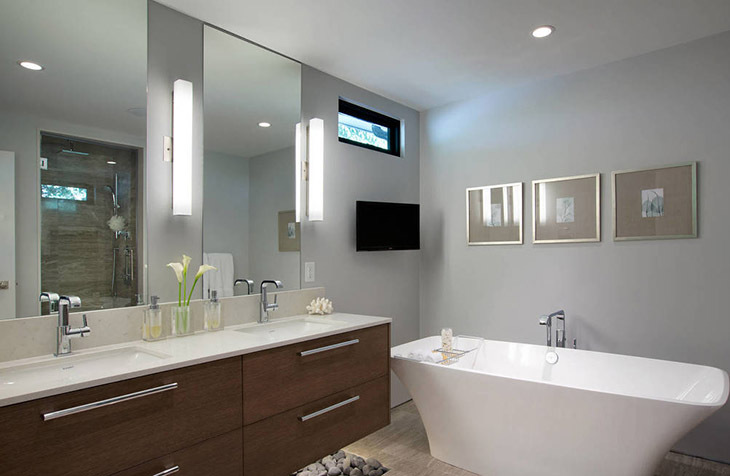 Recessed LED downlights are perfect for a small or low-ceilinged bathrooms because of their unobtrusive designs. Lensed downlight fixtures approved for wet locations may be mounted above shower stalls or bathtubs to provide supplemental illumination to the bathing and showering areas where the light emitted by the overhead light fixtures which are often installed in the center of the room may be blocked shower curtains. LED Wall Sconces - Ceiling lighting alone is unable to address all task requirements in bathrooms as it casts shadows under eyes, nose, and chin. Wall-mounted sconces are mounted on both sides of the mirror, at face height, and produce shadow-free facial illumination for grooming and applying makeup. The fabulous thing about wall sconces is that these versatile lights are fantastic for both task and accent lighting. Decorative wall sconces generate a soft atmospheric wash of light that seamlessly compliment a room's decorating scheme. LED Linear Lights - Linear lights are extremely robust lighting fixtures that add sleek utility and decorative illumination to the bathroom. The unobtrusive, low-profile design of LED linear fixtures makes them a perfect complement to general lighting throughout the space by adding a layer of depth to a room, assists with tasks in front of a bathroom mirror, highlights decorative surfaces and skims the wall or the ceiling. Use linear lighting to create a warm and welcoming ambiance and achieve consistent light coverage for under cabinet areas, toe kicks, and closets. LED Strip Lights - Light strips create extremely narrow lines of light for applications where miniature fixture size and maximal installation versatility are required. The waterproof, ultra thin and flexible LED strip lights are incredibly versatile for bathroom lighting. They can be mounted on each side or over the top of the mirror to ensure that those using the vanity will have sufficient light for shaving or applying makeup. They are also used to accentuate architectural features or to define a zone with light. LED strip lights can be mounted in straight, curved and irregular spaces – offering an abundance of design and installation possibilities in space-limited bathrooms. 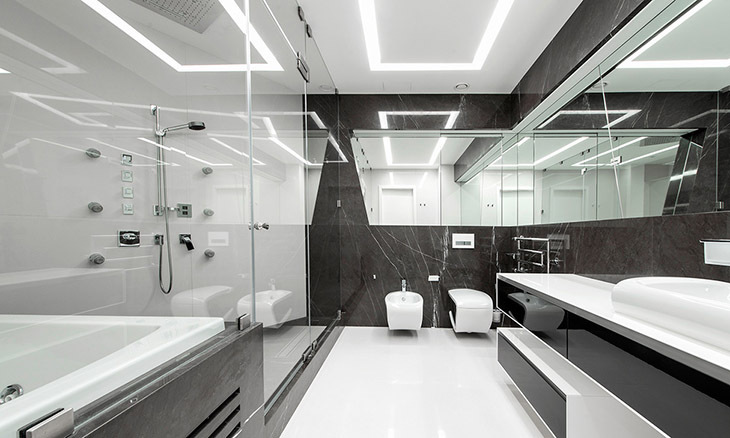 Lighting controls serve multiple purposes in bathroom lighting by automating or customizing the operation of lighting fixtures based upon occupancy sensing or remote control. Additional energy savings can be achieved by automatically lowering light levels or turning off lighting devices whenever possible. Occupancy sensors are used to detect human presence within a bathroom so that vanity lights or other bathroom light can be activated and serve as night lights to to safely light the path between the bedroom and the bathroom. Connecting ceiling- or wall-mounted light to a dimmer control will allow for a degree of flexibility in rendering the most appropriate lighting atmosphere to allow users to function comfortably in the bathroom.